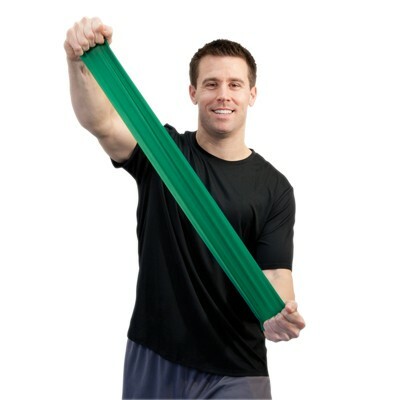 Sup-R Band® is made from a premium latex free formula and excels compared to other exercise band: our TPE latex free formula has similar use and strength characteristics to latex exercise bands; similar puncture resistance; similar tear and burst strength; requires similar force to stretch and contract; 5" width; has core for use with dispenser systems; made of Thermoplastic Elastomer (TPE); color-coded in Thera-Band® colors. Roll is packaged in a dispenser box. Unroll desired length of exercise band from dispenser box and cut with scissors.